The Costa del Sol is famous for its many golf courses. Most of them are excellent and are integrated in beautiful Mediterranean landscapes, with lush vegetation and great views and contribute to the fact that playing Golf on the Costa del Sol is a pure pleasure. For tourists who spend their holidays in the town of Torremolinos and have no desire to get into a car but want to enjoy a round of golf on the Costa del Sol, this week opened a golf course in the city, only 750 meters from the promenade of Torremolinos. Specifically, it is a golf course with nine holes ‘Pitch & Putt’, located in the urbanization La Colina which runs parallel to the path of the suburban train. The facility, built in a green area of seven hectares, currently consists of a tour of more than 30,000 m2 along with area of 16,000 m2 which forms the driving range. The rest of the area is complete with extensive woodland, a space reserved for the future clubhouse and recreation areas. In design of the area is outstanding the 7th hole, a par 3 of 130 metres from the tee to the green edge, baptized ‘Anguish’, to be an exact replica of the 12th hole of the legendary ‘Augusta National’, which means that Torremolinos has a piece of the mythical American ‘Amen Corner’. In order to promote the practice of this sport, registered citizens have a 30% discount on regular prices. Or do you feel more like discovering the outstanding Golf facilities in the province of Malaga? 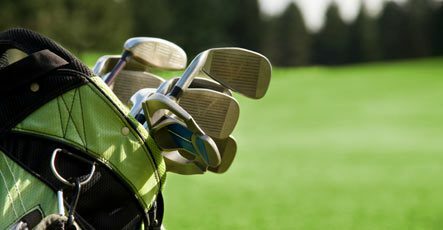 Then have a look at our comprehensive list of Golf courses in Malaga. Are you traveling with a group of friends? Then you might be interested in booking a 9-seater vehicle from our PQ group, as its high load capacity allows transporting the equipment of several players or check out a vehicle of the EA group for a smaller group.